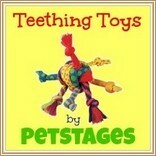 Kong teething toys for puppies are perfect for your little 'Jaws' impersonator! 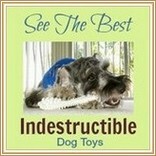 These incredibly strong chew-toys relieve the pain of teething and keep little mouths busy & out of trouble. The Kong company has been making super-tough rubber toys since the 1970's, and today the brand is well-known around the world, and has the reputation for producing the strongest toys on the market. Born from it's founder's desire to make a toy that would stand up to his German Shepherd's determined chewing, these toys have come a long way over the decades, and there's now a whole range of different shapes, sizes and designs. Heavy-duty rubber still features in the 'classic' designs, but there are also many other materials used today, including canvas, rope and fleece. Over the years, all of my puppies and dogs have played with Kongs, and I can honestly say that they definitely live up to their reputation in terms of strength, which makes them excellent value for money. This range is especially designed for puppies up to about 9 months old. The durable rubber Kong uses to make these is slightly softer than the rubber used for the adult toys - this gives your teeting puppy the firm pressure he needs on his sore gums, but isn't hard enough to be uncomfortable. The attractive 'baby' colors of blue/white or pink/white make it clear which toys are made with your teething baby in mind! All of these can be stuffed or filled with treats - both bought and home-made or just your pup's favorite goodies (peanut butter is the #1 choice in our house!). If you use Peanut butter or a flavored paste, you can freeze the filled Kong for a few hours, or overnight, for a longer-lasting play experience. If you've got a pup who's teething, he's probably uncomfortable and upset. 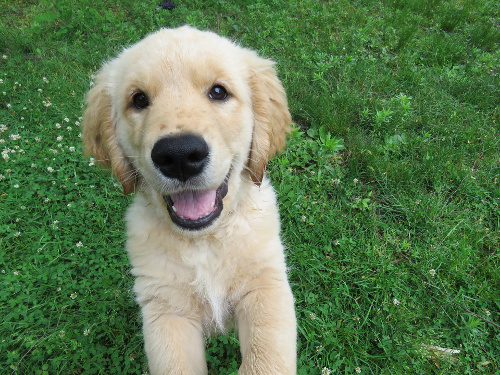 Teething puppies can be whiny, clingy, lose their appetite, and feel the need to chew on everything! In addition to the teething toys I've featured above, there are lots of other Kong toys that are good choices for pups of all ages, sizes. The red colored toys are made for adult dogs with average chewing abilities but they're also a great choice for large breed puppies, or especially mouthy breeds, because they can take more power chewing. There are also black Kongs for dogs who are especially 'gifted' in this area and for X-Large or Giant breeds. We had a black Kong that even survived being run over by a riding mower, THAT'S how sturdy these toys are! These are available in many of the same styles as the Puppy toys and the red Kong toys, such as the Original Kong, the Goodie Bone, and the Kong ball. Many of these designs can be used with treats, some of them (the fabric ones for example) can't. Bear in mind that these are just a few examples of the many - MANY - Kong toys available. The bigger pet-stores usually carry several designs/styles, and you can find a full range of choices online. Many Kong chew toys are also treat dispensers of one kind or another. From crunchy 'snaps' or biscuits, to tasty treat paste, there's a treat that works perfectly with any design you choose.